In early 2013 the long awaited 3rd movie in the Iron Man trilogy was released to much aclaim. The film shares the same theme as the first two movies and features Robert Downey Jr as Tony Stark. Playtech were quick on the heels of the production comapny and immediately licensed the video slot version which is now available here at La Isla Casino Tropez. The game has five reels and 25 paylines. It offers 2 bonus modes and a huge payout of 20,000 coins. 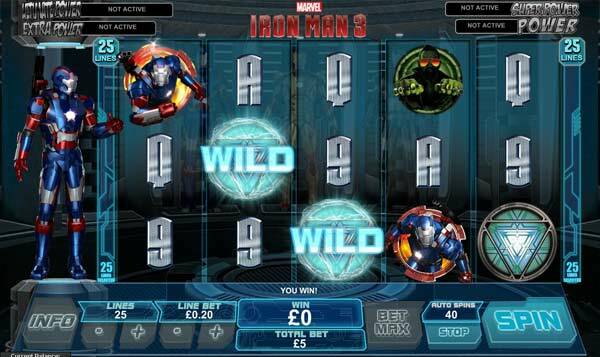 This is the very latest online slots game in the Marvel Slots range. The graphics in the game are truly amazing and the game is quick with great animations. During normal game play you can expect wild and scatter symbols. There are also the three Iron Man suits - IRON PATRIOT, IRON MARK 42 and WAR MACHINE. These symbols offer greater wins and can also trigger the first of the bonus features. Get MARK on reel 1, WAR MACHINE on reel 3 and PATRIOT on reel 5 to trigger a free re-spin of the reels. During teh re-spin the Iron Man symbols are held in place and become scatter symbols to increae the payout. The main bonus feature of this game is the FREE SPINS Hall of Armour bonus. 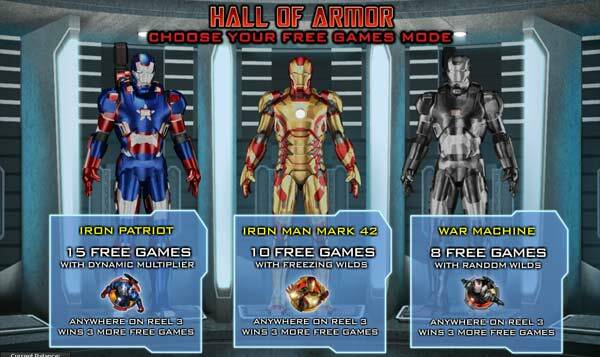 Get three or more free game scatter symbol and you are taken into the Hall of Armour to choose your armour suit. 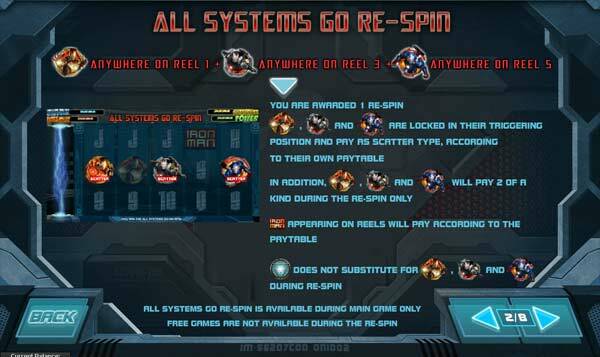 There are 3 free spins modes for you to choose from, each with their own special features. Choose from random wilds, sticky wilds or up to 5x random nultiplier on every win. This is a great game but depending on which feature you choose you will receive a set number of spins so please choose wisely.